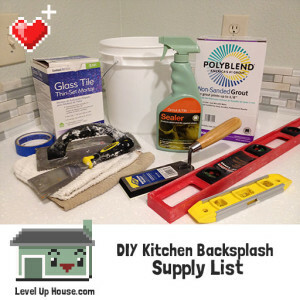 In Part 3 of our DIY kitchen backsplash series I’ll show you all the stuff I bought to make this project possible. 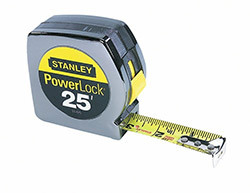 This tape measure is indestructible. A level is essential for determining if the gap you just bridged over your range area is actually level, and for checking your tile work as you go. Uneven tiles are immediately noticeable, so check your work as you go with a small level. I use a small level like this one for tile work. 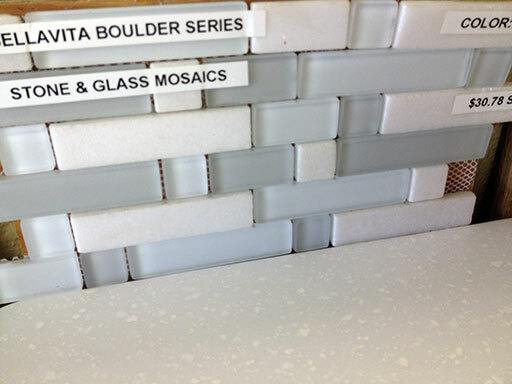 Read more about choosing the right tiles for your budget and kitchen. 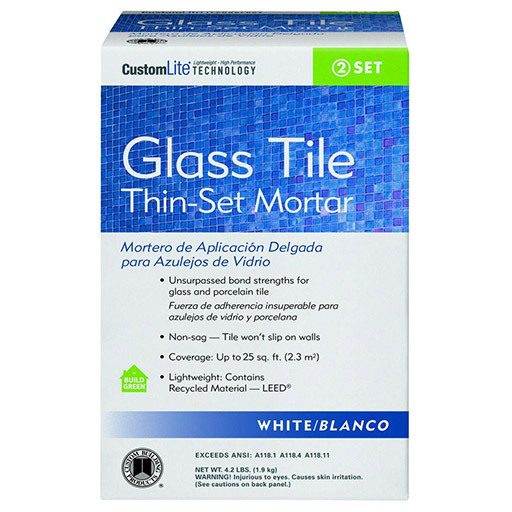 We used CustomLite Technology’s Glass Tile Thin-Set Mortar product (in white) which we purchased at The Home Depot. We cut the mix formula in half (the box holds 4.2lbs, we used 2.1 lbs) and used every last drop for our 8 sq ft backsplash. Glass tile mortar for our glass tiles. Your mortar may vary. There are about as many grout color choices as there are people on the planet, but I always say you can’t go wrong with white. 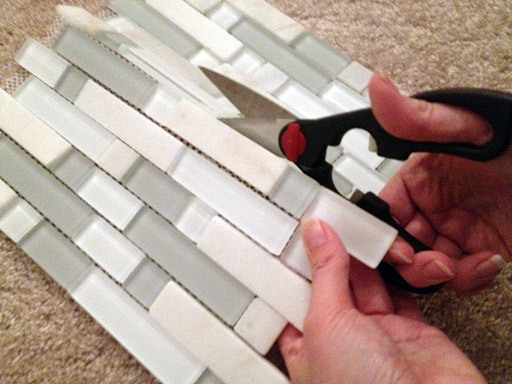 Scissors were necessary for cutting sheets in half, trimming mesh edges, and filling gaps with one-off tiles. Paper used to protect the few inches of counter top adjacent to our work area. 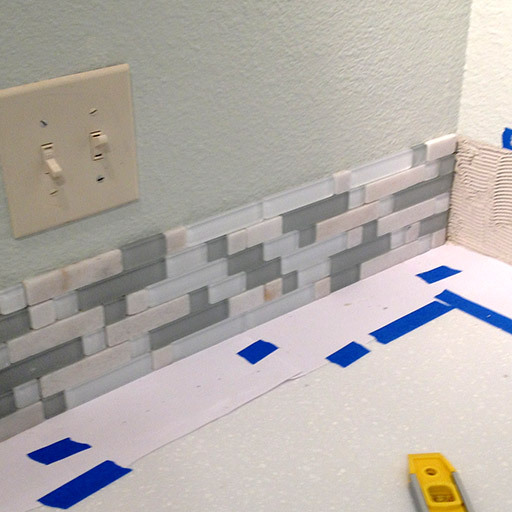 We used Scotch blue painter’s tape to secure protective sheets of paper between the tile and the countertop. We also used the tape to mask off the top of the mortar area to protect the painted wall above the backsplash. This stuff is completely worth it. Used throughout the installation to wipe our fingers and clean up smudges. Don’t use your prom bucket for mixing mortar, it’s going to get messy and scratched. Our all-purpose metal scraper was used to mix the mortar in the bucket (it gets pretty stiff, a paint stick won’t cut it) and spread the mortar onto the wall. Get a tough one, you’ll use it in every other DIY project you do. The v-notch trowel was essential for carving thin lines into the mortar once we’d applied the mortar to the wall. The lines help the tiles squish onto the wall and adhere using a thin, even layer of mortar. Don’t skip this tool like I almost did, the little notches of the v-notch trowel make a HUGE difference in how nicely your tiles squish onto the wall. Your float trowel is for spreading grout over the delicate tile surfaces. 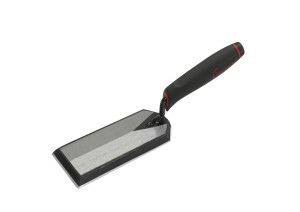 A float trowel is smooth and soft to protect your tiles from scratches. We had two: a wide one and a narrow one (for fitting the short area under the window ledge). 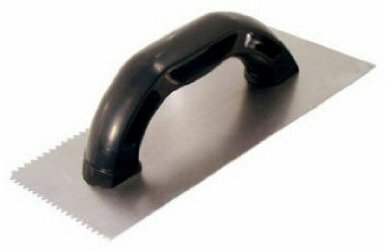 Not to be confused with the metal scraper (which might scratch your tiles) or your v-notch trowel (which will definitely scratch your tiles). Question: What’s the difference between a normal sponge and a grout sponge? Your grout sponge is for gently wiping grout off the face of your tiles as it cures. These cost somewhere between a buck and ten dollars. We used one that cost somewhere in the middle of that range and everything went fine. 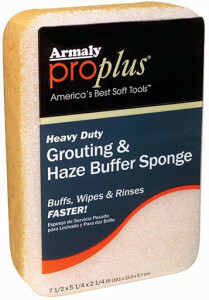 A fancier grout sponge with built-in haze buffer. Whether you splash out on a Cadillac sponge or get one from the dollar store, use a clean, new sponge. 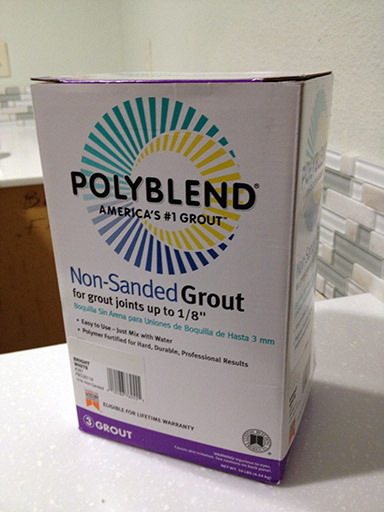 You don’t want particles from your last sponge project getting into your nice grout or marring your pretty tiles. For sealing your tiles against stains and other unpleasantness. 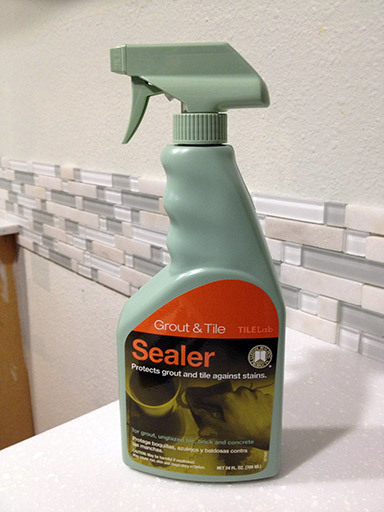 Match the sealer type to your type of tiles. Our tiles are some kind of stone (quartz, maybe?) and glass. 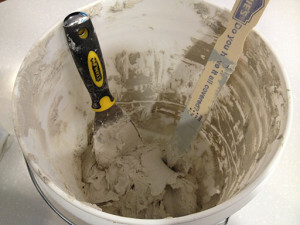 Mixing the mortar is dusty but unless you’re mixing a ton of it, it probably won’t be a problem. Protection is up to you – I wore science class goggles and a cloth breathing mask, but my two helpers went without and everyone was pleased with their choices. To help you find the right products quickly, links on this page are Amazon affiliate links. As always, LevelUpHouse and I encourage you to shop around, shop local, and shop wherever you like. If you decide to shop at Amazon, your purchase through any of these links helps support LevelUpHouse!